Back on solid ground now, back to work and not much time for blogging. Hopefully we'll go exploring this weekend. 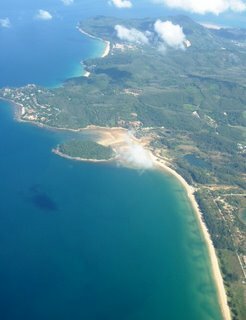 On the photo above of Northern Phuket, in between Bang Tao and Naithon, is another beach, which I believe is called Layan beach. I want to go there....in the meantime, I'll try to add on a couple of hotel recommendations. We're in peak season now, and the weather is great. But a week of travel and diving has left me tired. If you get the chance, I do recommend a stay at Borneo Divers Resort in Mabul. Air Asia has some great deals from Phuket to Kota Kinabalu at the start of next year, and from there it's just a short hop to Tawau, from where you are looked after. I'd like to go back with my wife. 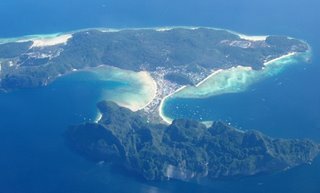 More views from the air here... we took a seaplane flight to Phi Phi and back..